I've been working away on a circle journal entry and really struggling. My mojo and my enthusiasm seem to have left the country without me - apart from the cj I haven't made anything for days, not even a birthday card for my sister which has to be posted tomorrow! These are the last 2 cards I made - this one is Lola with bunny from Sugar Nellie colored in with my Prismas, fabulous K&Co McKenna papers, a piece of paper ribbon from a Scrapagogo kit, flowers and brad from my stash & the Happy Birthday stamp is from Stamps Away! This one was an experiment and kind of followed a tutorial on SplitcoastStampers - not sure if I like it but never mind! Bazzill cardstock, Making Memories Noteworthy paper and the stamp is from my SU! Doodle That set. And time seems to be flying even quicker! I suddenly remembered that the recipe cj I'm in finishes in 9 days so I've got 2 entries to finish off (one is from when a cj went missing so I needed to re-do my pages) - can't wait to get it home but in the meantime I have cramp in my hand from working on them for so long tonight! I promise there will be at least one card tomorrow but tonight I haven't got the energy to get up & find my camera! To keep you going go and have a sneak peek at the fab new range of stamps coming from Sugar Nellie - if you loved Holly Hobbie when you were little you're going to love these stamps! I made a card! I did it! Although I don't know if I like it! Been a funny old day today - not in the 'ha ha' sense either! Had to rush off to the docs for an emergency appointment as one of my beautiful mogs sliced the back of my hand open & I needed a couple of butterfly stitches! It wasn't the cat's fault though, we had a complete idiot knocking on both the front & side door trying to sell fascias and double glazing - it upset the indoor mogs but Lump decided to scratch me as I was taking off his collar to replace it at the time! I also got a free book today - it's for a review group and means I was one of 20 lucky people to get a copy before it's published! Completely random but does anyone know where I can get A*Muse stamps from in the UK? I came across a couple that I just have to have whilst blog hopping earlier but as yet haven't had any luck finding a stockist. New batteries are in the camera and the spare set are charging away as I type! I've had a really lazy day today - H has been home and he should have been in London til Monday so I've not dared get my Expression out! One good thing about him being home is that I managed to convince him to cut me 40 4x4 mountboard squares for my fat pages - I had a go but it's just too thick for me so I gave up after cutting 2! Lol! I've been playing with my new Bella's the last couple of days - here's my first ever Bella card, Bookwormabella! Papers are from the March Gogo Greetings kit (I'm ashamed to say I can't remember what they're called - I vaguely remember Scenic Route or Wild Saffron?) Bazzill cardstock embossed with the Cuttlebug Swiss Dots folder, yellow ribbon from the Scrapagogo kit as is the chipboard button. I also got my gorgeous Sugar Nellie 'Maggie' stamps out this is Maggie wearing a heart jumper! Papers, ribbon and chipboard button are all from my Scrapagogo kit again! Yes, more snow - and it settled! I think this is the first white Easter I've had! As you can see one of the mogs was up and about in it - he did not like having wet feet! Here's one of the cards from over the weekend - still attempting to do the last bits of my cj but until the replacement ink cartridges arrive I can't :( It's a Sugar Nellie this time - I think Rock Star came from the kit they released at the end of last year but I can't remember! Coloured in with Prismacolors and Sansodor & the papers are Dovecraft Masculine again! *ETA* Just for Beth, this is the rather lovely David Tennant who is the current incarnation of Doctor Who! Thought you'd like to see something other than a Tilda so here is a Sugar Nellie stamp! It's Dress Up Maggie - took me ages to get this one as it's always out of stock! I finally nabbed it but shockingly I've only just got round to using it! Paper I think is Dovecraft Retro Floral, Dress Up Maggie stamp (colored in with my Prismacolors) and I have no idea what brand the 'wonderful' stamp is! There's a new challenge up over on the Tilda ATC challenge blog - the theme is In the Pink but I think my entry is more suitable for the first challenge than the ATC I actually did! Pics tomorrow even though I had it finished this afternoon! I will learn one day that Stickles take more than 10 minutes to dry! Hope everyone is enjoying the delightful weather we're having in this country - sat in my scrap room tonight watching ones of the trees in our garden being blown half over! The card today is for a challenge over on Marlene's blog to win some candy. You had to use green and some ribbon so hopefully I've got both covered! The papers are all Basic Grey 'Phoebe' again, the 'Love Tilda' again and yet another ribbon from one of my Little Silver Hat kits! I don't know if you can see it in the photo or not but the ribbon is pink & green - two birds with one stone! Been playing with Sugar Nellie stamps tonight - finally got round to using the gorgeous Dress Up Maggie, pics tomorrow! The hands are much better today so I got a couple of cards made but I'll show you the ones from yesterday as no pics of the new ones! The first one is a Sugar Nellie stamp, the one with cake :) The papers are from my scrap box, the flower (the middle is liberally daubed with Black Diamond Stickles) is out of my blossom kit from Rebecca and the ribbon is from one of my fabby Little Silver Hat kits. It's for challenge #3 over at Sweet Sugar Challenges - I knew I'd seen a challenge somewhere saying to use b&w with pink! The second card is using one of my fab new Bootiful bunny stamps with a couple of the Papermania Easter papers - a very thoughtful present from Grandad! These two cards might look a bit wonky - I really shouldn't try and do stuff when my hands aren't working! Lol! 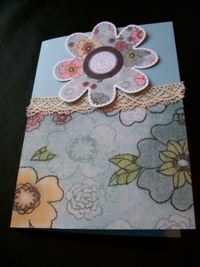 These cards were made from the February Scrapagogo kit featuring the Fancy Pants Crush papers - they are so gorgeous! I think this is the first time I've used the kit on the day I got it! The first card is a thank you card for someone and the second one is for my pal Ally - whose lovely fiance forgot it was a leap year and proposed to her 3 days before she was going to ask him! Nothing done today - feeling a little sad today :( I almost broke my stash diet and bought some of these fabby stamps - I absolutely adore bunny rabbits! I also have the LCR kit on pre-order from Funky Kits but as far as I'm concerned you never have enough bunnies! Lol! Anyway, I would have broken my stash diet if it wasn't for Grandad who decided to treat me - I think Grandad is a star!!! And that's not just because he bought me stamps! Back to normal service tomorrow - complete with pictures!!! So how do you like the new look??? Thought it would be nice to have a bit of change so I went for this one - got to get a bit of pink in somewhere! All I've done today is faff about with my Sugar Nellie ATC's - still not happy with them but they're going postal tomorrow so tough luck! They've got all sorts on them now - incuding some Heidi Swapp pink tulle, Cherry Arte spotty paper and lots of ink! Here's a sneak peak, only of the unfinished images - you don't get to see a finished one! I can finally get back to cj's & cards now. I did take pics but yet again they're useless! After reading a post on UKS by another Gogo girl that has arthritis it appears her pics come out like mine do - so I could have another excuse! Lol! Anyway, it's been way too dark today to take pics so I didn't bother, would probably come out pitch black knowing my luck! The bunny kit is up for pre-order over at Funky Kits but closes in a few days, I'm just hoping my cheque clears in time - I've been very good today and not looked at any stamps so I've not been tempted, except a couple of exceptionally gorgeous Penny Black stamps. If they're still in stock on pay day I might even treat myself! Off to bed - books to read! One thing missing from my scrap room is a bin - as I discovered that you can't really chuck DST backing or inked pieces of felt on the floor! 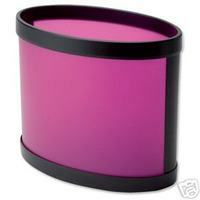 Solution to this problem - this fabby bin! Hopefully it'll be mine by next week and in the meantime I guess I'll have to use an old plastic bag! Sssh, don't tell anyone! Started another cj tonight - this time it's mine for our team cj and is slightly late, oops! I have however started again with a new theme and I should have it done by Thursday which means I should be able to catch up by the end of next week! Also started my ATC's for the swap and discovered that Shopping Nellie is a bit bigger than I measured and only just fits on! Right, off to bed - was up at 7am this morning for some bizarre reason! So maybe the aches weren't from cutting all that EZ Mount - woke up this morning hardly able to move, so think I might be flaring! Have increased my anti-inflammatory pills so let's see if that helps. DH continues to amaze me - after sorting out his clothes (including his rather large collection of vintage football shirts!) he pulled everything out from under the bed today. There is now fresh air under the bed instead of shoes, boots, hot water bottles and a few books! Oooops! I spent the day stamping and playing with my Sugar Nellies - tried out my Derwent Inktense pencils which are lovely, nice colours and I'm wishing I'd got the tin of 24 instead of 12! Played with my Prisma's as well, dh always forgets what the Sansodor & paper stumps are for so I had an audience for a bit - very disconcerting but he did like what I was doing :) Also signed up for A Sugar Nellie ATC swap on UKS which looks really good! Already chosen my stamp and will get started as soon as my supplies of card are replenished. No scrap room/stash sorting done either - sore shoulders really prohibits quite a lot :( Off to hydro tomorrow so hoping that lovely warm water will help! Today's pic is of 2 of my furry monsters being cute - & quiet! Really aching today - must learn not to use scissors for more than an hour at a time! Still, didn't stop me doing the rest of my Sugar Nellie stamps today managed to get the rest onto the bit of EZ Mount I had left - just need to remember to buy some more soon as I have quite a few UM stamps to do. Progress is slow in my scrap room. I've moved quite a bit through from the front room and I get the distinct feeling Grandad is quite pleased! Going to get in there early tomorrow as he's going to paint the window so the curtains can go up!!! I'm a day behind with Journal your Christmas but i'm hoping i can catch up tomorrow. Might not happen as dh has announced at the last minute (ie. 20 minutes ago!) he's got a day off which means rethinking tomorrow's dinner menu too. I hate people who won't eat vegetables - never used to bother me but now we do 95% of the cooking from scratch it's so bl**dy difficult to find dishes he'll eat. Grrrrrr!!!!!! Foorgot to mention it but check out the Sugar Nellie blog to keep up to date with all the news! Made my chocolate and apple crumble tonight - Grandad hasn't sampled this before so was a bit unsure - he ended up eating 2 portions so i think he liked it!!! No recipe really but grate a small amount of decent dark chocolate into the crumble mix and remember to add a decent amount of cinnamon.